It is rare that debut work is this exquisitely polished – more often than not, debut authors are well within the vicinity of great work, but lack either the editorial resources or distance from their own work to give it that final, lustrous sheen. 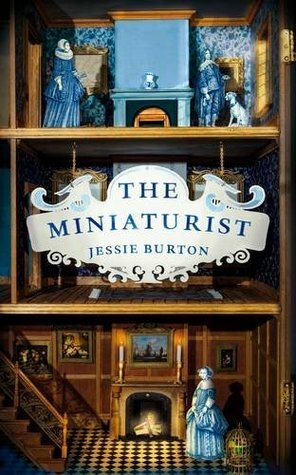 The Miniaturist has a plot filled with splendid characters and superb undertones of menace. Petronella is a young wife, recently married to a wealthy and charismatic merchant from the city. But she finds her new home forbidding, peopled by a seemingly cruel sister-in-law, insular servants and an absent husband. Her marriage bed is empty, she is far from home and she is but eighteen. Her marriage and new life speaks to the traditions of its setting, of Calvinist, gossiping and loveless Amsterdam in the late 17th century. To try atone for his absence, her husband Johannes presents her with a fine cabinet, a perfect representation of their household. This dollhouse is hers to fill with miniatures. Initially piqued by this seemingly childish offering, Nella decides to spend her husband’s money furnishing it. But the items the miniaturist sends are too perfect, and each one begins to predict the unravelling of the Brandt household. The work is lovingly researched, buoyed by a fully-fledged realisation of its settings, and the complex nature of the city. The city breathes into the plot, shaping its peoples as it surely must do. Just as Joburg makes its citizens busy, frantic, sometimes hard but always interesting, Amsterdam swings from God to guilder and back, a city obsessed with work, religion, money and the sea that threatens to drown it. It is a remarkably nuanced book, referencing food to clothes to the criminal justice system. But it is more than that. It is a story of a young woman who must grow quickly, who must learn bravery and cunning and kindness, and does so realistically and believably. I am always going to love a well-formed female protagonist, one who the author does not have to beg us to like or love, who entreats our attention and respect through her own actions rather than what others unconvincingly say about her. The Miniaturist has a compelling plot, no cheap tricks and is a wonderful slice of history. This debut author has a grace and poise to her words that some established authors can only dream of. This is a writer’s book, filled with exquisite turn of phrase and character development. I imagine its heavy material will put many off, and it certainly has no neat and happy accidents, but it is absolutely a jewel, especially with the wonderful production that has gone into the Picador edition. It is a fine addition to the discerning reader’s bookshelf.